Senate President Bukola Saraki, on Tuesday, urged ministers, lawmakers and other office holders to jettison 2019 and focus on good governance for now. He said it would be insensitive for any politician to abandon good governance to take on politics at this crucial time. He also spoke on the fuel scarcity issue and described it as ‘man-made’. Said he, “This is the last productive year before we go into electioneering. It is too early for the politics of 2019 to take over the role of governance. We must put governance first. “We have all been witnesses to the suffering in this country, especially during the Christmas period. The fuel scarcity is man-made. I thought we had passed this stage. It is our responsibility that we get to the bottom of this and hold those responsible for the scarcity responsible. 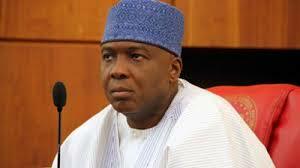 The said Saraki is an illiterate- what is the difference between governance and politics? The days of illiteracy in this territory of the natives are over. The fraudulent political name Nigeria is dead, the said 2019 is dead. It is now Disintegrated Republics of the natives which must be defended in the ongoing Revolution War of the natives. God Is With Us!! !